Today I have for you my second themed Monday manicure for Polish-Aholics Anonymous. This week's theme is floral. As soon as I found out it was floral, I knew what I was doing. I've had this idea floating in my brain for a while. The night of the Stanley Cup final, Don Cherry wore a particularly humorous suit. Hilarious. I knew as I saw this that night I would need to do nails inspired by the suit. I got this picture from a blog called Don We Now Our Gay Apparel. The name is so perfect. Good blog. 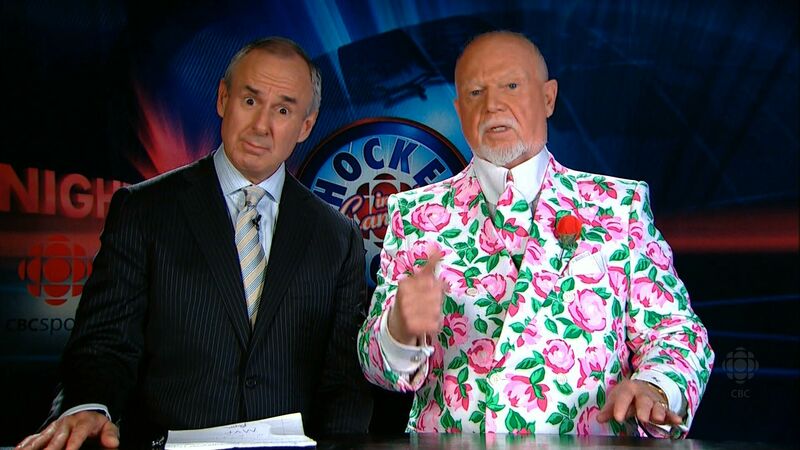 Check it out and see more of his funny suits if you're not familiar with Don Cherry and his ridiculousness. So. Perfect time for a floral theme in Polish-Aholics. Looking at them now, I'm not totally pleased. I wanted to try freehand ones but I think stamped ones would have looked nicer! Oh well. You might have noticed that my nails are really short. I broke one last week. But it's okay - I planned on cutting them down before I go away, so I don't have to worry about breaking them while hauling luggage back and forth or something. In other news, the Canada Post mail strike is over! Mail should be resumed tomorrow. Hopefully I'll have a bunch of nail mail to show you guys soon! This looks really good! That suit...hilarious! oh wow...what a...festive...suit! I actually really like the way your nails turned out. Freehanded and it looks great! I love floral, I've done it myself too couple of time. Your nails look great. I love his suits. There have been so many that could be good nail art. That is hilarious! I went to the site so I could look at them all. I hate Don Cherry but I love this! You did a great job! Lol at his suit! Your manicure looks way better. Damn you for being able to do freehand roses, haha! lol... I love it! Who knew Don Cherry could inspire something so pretty? I think your freehanding looks great! No need for stamps, yours look just as good. I LOL'd at the suit!